…But social media posts have emerged of Rice crowing “up the Ra” and his hope of playing AGAINST the Three Lions…. 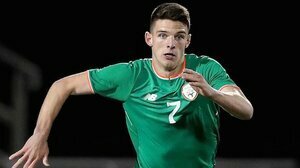 Posted in Misc and tagged Declan Rice, IRA at 4:34 pm on March 21, 2019 by Aaron McAllorum. Rice in hot water etc. a sweet and sour moment for Rice. Respectfully disagree, I think it’s hilarious. What nation isn’t obsessed with sport? Oh there’s a shocker, a 15 year old says something stupid. Thanks be to Oden there was no social media when I was 15. Ha ha, I checked he’s cool with it, he once spelt my name Owen so we are even lol. Thank Zeus someone got there before me. Surely the shocking thing here is that someone trawled through years worth of posts and comments from him till they found that. Now that is tragic. I wouldn’t trust the person that got the ball rolling on this ……what a petty , vicious botty. Cue Irish Times pearl-clutching gammon uproar. Who cares?